by Jerold Panas. Emerson and Church Publishers, 2013. Author and financial resource developer Jerold Panas has spent his life in the area of philanthropy. 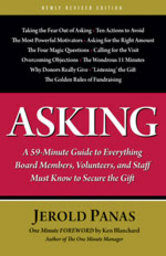 He says, “There’s no such thing as an incorrect ask.” He adds that asking-however it is done-is the most important action to take and is the task of everyone in any organization, including laity who do not hold a finance team or committee leadership position. Yet Panas realizes that many people are not comfortable asking others for money, so he offers knowledge, skills, and tips for securing donations. Some topics covered are the importance of listening, relationships, confidence, consistency, and follow-through. Panas discusses objections, offers a process for asking, makes suggestions for finding likely donors, and explores why donors give. The appendices include sample letters for communicating with possible donors. This secular resource is practical, full of information, and appropriate for any congregation seeking to expand its fundraising perspective and success.